Problem solving is something that everyone has to do. Sometimes decisions are so simple that you don’t give much thought to it. At other times, decision-making can be very complex with a large number of possible outcomes. When business leaders face complex problems in their organizations, the outcome of their decisions can have ripple effects throughout the organization. So the question deserves to be asked: how are these problems addressed. Going with the first thing that pops into your head isn’t always going to be the best answer, nor the most complete answer. Sometimes, we decide to “jump off the bridge and build a parachute on the way down.” However, it isn’t until after we have jumped off the bridge that we realize that we should have jumped a bit more to the left or to the right, then struggle, sometimes in vain, to attempt to compensate. Other times, perhaps, it is simply the wrong bridge. Or perhaps someone had already built an elevator. Evaluation: How urgent is it? How important is it? Is it something I can truly do anything about? What could potentially happen if I do or don’t respond? What have others done in the past? Based on my experience and education, what is potentially the best answer? This model supports everyday challenges that business leaders face. However, it can be short-sighted; an individual only knows what they know, so the realm of possibilities to solve a problem is somewhat limited. For example, if you and your associates only know of one way to get to a location, if something happens to the route you normally take, you may believe that it is not possible to reach the destination, when it is possible that someone with superior information may know of several other ways to get to the same destination. 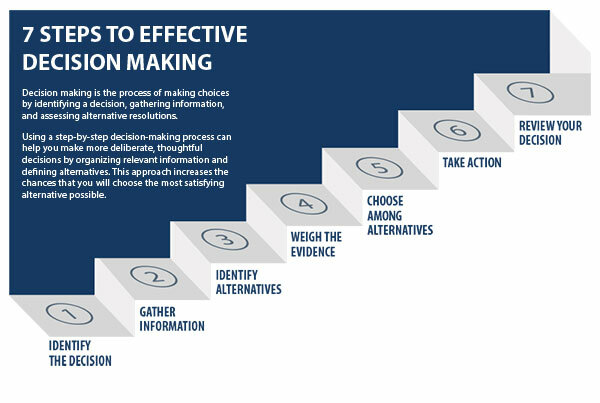 This model supports more complex decision-making and addresses the limitation of only knowing what you know by recommending deeper investigation in the information-gathering process and supports the idea of developing your own more creative decisions. It goes beyond knowledge that you and your associates have and supports digging into multiple resources to gather information. What could be added to the information-gathering step is listing ALL alternatives, perhaps on a white board or mind map of some type. Why? Because sometimes “good” ideas come from “bad” ideas, and the flow of ideas can be (will likely be) limited if alternatives are critiqued before all of the potential ideas are presented. So while sprouting wings and flying might be a bad idea, perhaps another way to get over the gap may be appropriate. The last step in Dartmouth’s model is where we learn from the decision that was made. Not only are we determining whether or not the solution solves the problem, we are determining how the solution could have been better or worse and potentially finding other related solutions to the problem. Here’s a link to the full .pdf from Dartmouth: Decision-Making Process. I’d love to hear your feedback on the process and perhaps the process that you use to solve more complex problems.